Tucked away in a wooded setting, Hidden Hideaway is the perfect getaway cabin for one or two couples. Fully equipped with two bedrooms; one with a queen bed and one with a double bed and a full bath on the main level. You will also find a great room with living area, kitchen & dining area on this level and wrap around porches. The living area has a small gas log fireplace, large sofa with lounger and TV with satellite. The lower level has a large game/rec room! You can enjoy the pool table, foosball table, and 2nd living room area with oversized sofa with lounger. The hot tub is also located outside this level on a covered patio. The main level wrap around porch is great for relaxing and catching up with friends or family. Just off the main level deck is an awesome large firepit ideal for roasting marshmellows, hot dogs, or just counting the stars. Hidden Hideaway is perfect for a family vacation with two levels! Just minutes from town and Horseback Riding make this cabin your next vacation destination! **Please note: The staircase to basement is very steep and may not be ideal for elderly guests or those who may have trouble negotiating stairs. 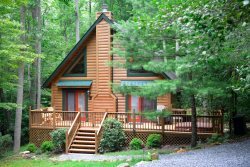 This North Georgia Mountain Cabin Rental is only about 5-7 minutes from Downtown Blue Ridge, GA. Hidden Hideaway is a cabin with a great overall location, and has close proximity to tubing, hiking, biking, Lake Blue Ridge, and the Toccoa River. The Blue Ridge area cabin rentals are in the Toccoa River Valley, which is very close to the Cohutta Wilderness Area, USFS, Adventure Trail Rides for Horseback Riding, Blue Ridge Canopy Adventures for zip lining, and the Benton McKaye Hiking trail, which is the largest spur of the Appalachian Trail. Hidden Hideaway is very private, nestled in the tree tops, and is considered a private Blue Ridge, Georgia Cabin Rental. The team members we dealt with were friendly and very helpful. The website was easy to navigate and Georgia mountain cabins kept in touch with us with email until the day of our trip. We were given very good directions to our cabin and found it to be lovely and very clean. Our stay was delightful. We enjoyed the privacy and amenities that are cabin provided. It was nice that the road to our cabin was paved and the cabin was easy to find. Wonderful experience with cabin rental. Privacy in the woods. Very clean and well maintained cabin. I was not able to use the website to book as I was booking within 48 hours of occupation. I spoke with Georgia on the phone and she guided me through my options and was able to find me a great cabin. Whoever was there at the office was very friendly in helping me check-in and the trip was great from that moment on. Wonferful. Everyone was very nice and called us on our 2nd day to see if we needed anything and if we were okay. The team was fabulous!! We got snowed in with impassable roads and the team put our safety first by calling us and telling us not to leave the day of our check out and that they were putting the next guest in another cabin so we could stay in safe.